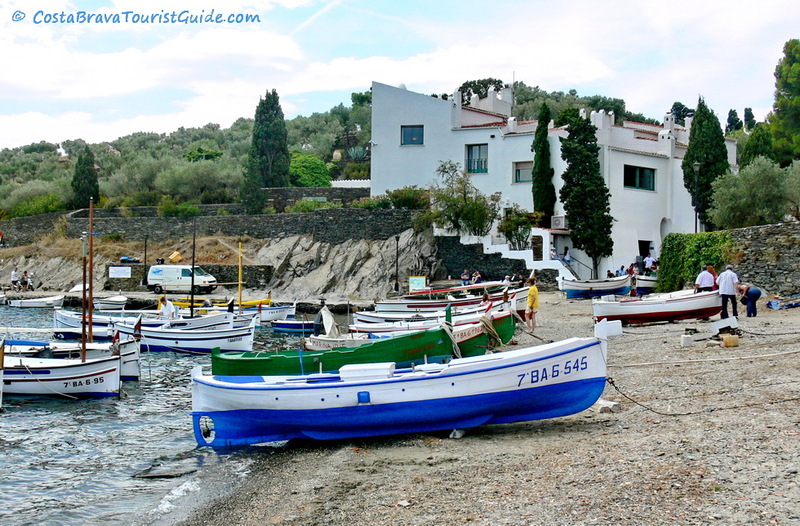 CostaBravaTouristGuide.com — The beautiful fishing village of Cadaqués is sometimes referred to as an island on the coast. That is because it is relatively protected from mass tourism by a long, winding road through the mountains of Cap de Creus. The town is home to fewer than 3.000 people, but during the peak summer tourist season more than 30.000 people visit the place. Nestled between the capes Norfeu and Creus and flanked by mountains — including El Pení (605m) — the white village of Cadaqués is particularly beautiful to see. The place has a distinctly bohemian-chic feel to it, and is known as a meeting point for artists, intellectuals and free spirits. Such artists as Picaso, Mark Chagall, Marcel Duchamp, Henry Matisse, Mauric Boitel and Mick Jagger spent time in Cadaqués, and through the years the village has attracted a largely upscale public, which has cemented the town’s reputation as an up-market resort more suitable for arty adults than for families in search of a ‘typical’ beach vacation. The time that Cadaqués was considered the artists’ capital of Spain is long gone, but its charm has remained. If you had a penny for every person who, upon visiting Cadaqués, has said they’d love to sell everything they have just so they could move here you’d be very rich. What we found unique about this village is that even while you know there are lots of (other) tourists around, it doesn’t quite feel that way. It’s hard to put your finger on it, but somehow this place manages to retain that tranquil, ‘nothing-ever-happens-here’ feeling. Quite relaxing indeed. In fact we’ll come right out and say it: we’ve seen Costa Brava towns and villages up and down the coast, but Cadaqués is our all-time favorite town in all of Spain. Nowadays many day-trippers come specifically to see the house of Salvador Dalí, who in 1930 settled in the tiny nearby village of Portlligat. His house — or, rather, series of interconnected houses — has been turned into a museum: Casa-Museo Salvador Dalí. Dal&#237 stayed in Portlligat until 1982 when, upon the death of his wife Gala, he took up residence at the castle he built for her in Púbol. Note that if you plan on visiting the museum, you must always make reservations. Groups of up to eight visitors enter the museum at ten-minute intervals, and are guided through the labyrinthine structures. The 40-50 minute visit is virtually mandatory for any self-respecting Dalí fan, and is well worth the trip. 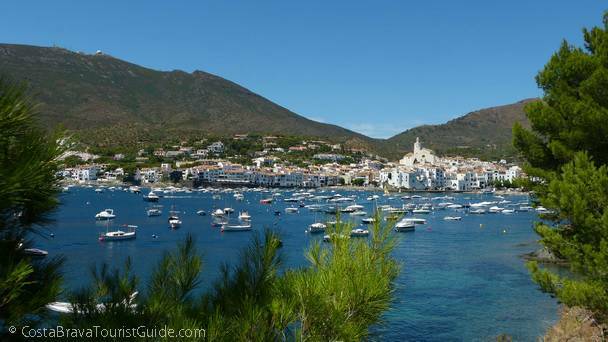 Spent the rest of your time before or after the museum visit exploring Cadaqués. Alternatively, if you come with private transportation, enjoy the fine-gravel beach that overlooks the beautiful bay. One thing that sets Cadaqués apart from so many other town along the Costa Brava is that its natural setting — combined with zoning rules and regulations — have prevented unchecked growth. If you come by car, park at the car park at the entrance of the village. Then make your way up to the Barri Vell (Old Town) — a maze of steep, narrow streets paved with rustic stones and dotted with benches and flower pots. Incidentally: Cadaqués is made for pedestrians. Almost no place in the inner city can be reached by car. Leave your car at one of the big parking lots at the outskirts of the city. Approaching by sea from the north, the Bay of Cadaqués spans from Punta de Cala to Punta de S’Oliguera. Along the way there are lots of indentations in the foothills of the Cap de Creus, most with delightful small beaches. Many of those beaches can be reached on foot; others only by boat. The water of the bay is crystal clear, and diving is a popular pastime here. That said, while the water quality is always good to very good, the beaches are small — and consist mostly of pebbles, rocks, and/or course sand. Even Gran i Esportal, the primary beach of Cadaqués, consists only of large pebbles. And Es Pianc, the small urban beach at the center of town, sports only gravel and dark sand. In general these beaches do not attract families with small children, and overall you’ll find the beaches here less crowded than elsewhere along the coast. You could easily spend and entire vacation in Cadaqués and not get bored. But this is also a perfect place to visit for a few days. If you want to relax, explore the village, visit Dali’s house (count on a 20-minute walk from the center of Cadaqués to Port Lligat, plus at least 2 hours to see the house, waiting time included), and dine at a few fine restaurants, give yourself at least two nights here. Due to the long, winding mountain road the 40 km trip by car from Figueres may take up to one hour. From Roses: 17 km, about 25 minutes. From El Port de la Selva: 13 km, about 15 minutes. It’s a 2½ hour drive from Barcelona. If you arrive at the Barcelona or Girona airport take the train to Figueres and get a taxi from there. The taxi should cost just shy of €50. There is a bus service as well, with buses leaving infrequently. Bus schedule. If you arranged for a hotel, the hotel may provide a shuttle bus service. The tourist office is located at Carrer Cotxe 2-A, and there also is an information centre is at the entrance to the town, in Av Caritat Serinyana. Within Cadaqués pretty much everything is in walking distance, but some streets and alleys are quite steep. If you want to venture a little further we recommend that you rent a scooter. People with a mobility problem can also rent mobility scooters. If you plan on visiting Cadaqués on a day trip do whatever you have to do to arrive as early as possible. Plan to have breakfast, lunch and dinner in town. If at all possible, try to make dinner reservations ahead of time — either before your day trip or as soon as you see a place where you would like to dine that evening. We have had the distinct pleasure of sampling several of the town’s restaurants, and are convinced that they serve some of the best food we’ve ever tasted anywhere along the Costa Brava. We’re especially impressed with the friendly service we encounter everywhere.